It's been a long time since my heart was this heavy. And I don't know what to do with it. I went to bed last night spinning marbles around in my head. I woke up this morning desperate for a word, a hope, a plan, an answer. It's not for me or my life, no worries. I can keep going like this indefinitely, happily. It's when the lives of those I love push up against me and I feel suffocated by the loving. I write an email today and I say that God has given me the ability to love large, but I'll be honest, all that large loving threatens to take me down sometimes. So whether it's the crush of sin, the weight of life, the angst of cancer, the sorrow of broken-heartedness or the fear of bullying--I feel that and it feels hard. So hard. And heavy. I read James, chapter one this morning: If any of you lacks wisdom, let him ask God, who gives generously to all without reproach, and it will be given him. And I've breathed that all day. 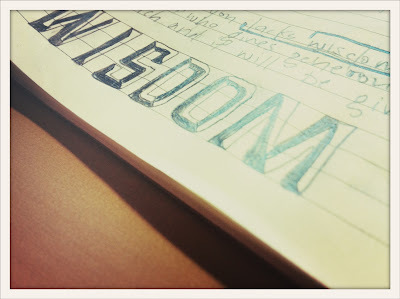 God, give me wisdom. Give it to me generously. I can do without the extras: the hope, the vision, the plan, the adventure, but God, please give me wisdom. I write it in the bottom of my journal. Block letters, doodled. I mull over it while I scribble in lines. I don't know what wisdom is here. That's the point, I guess. That's why if we lack it, we ought to ask for it. Wisdom is to be asked for when we don't know what to do. A few years ago a man laid his hand on my head and laughed a prophet-father's laugh: "You're very wise," he said. "And you can tell people what's the right decision and what's not, but in your own life you don't know! In other people's lives, you can tell them what's right and what's not right. And the Lord would say to you that he's going to give you that kind of prophetic insight into your own circumstances." And I wait for that, reader, I long for that. I long for the day when I can encourage myself as easily as I encourage others. I wait for the day when I can see as clearly into my priorities and questions and heaviness and know what the answer is. I ask for it today. All day. I ask for it.